We have created Africa’s first Cachaça (kuh-shah-suh) and distill it using the traditional Brazilian process. The beaded design on the label references the traditional Zulu beaded love letters given to Zulu maidens as a symbol of affection. 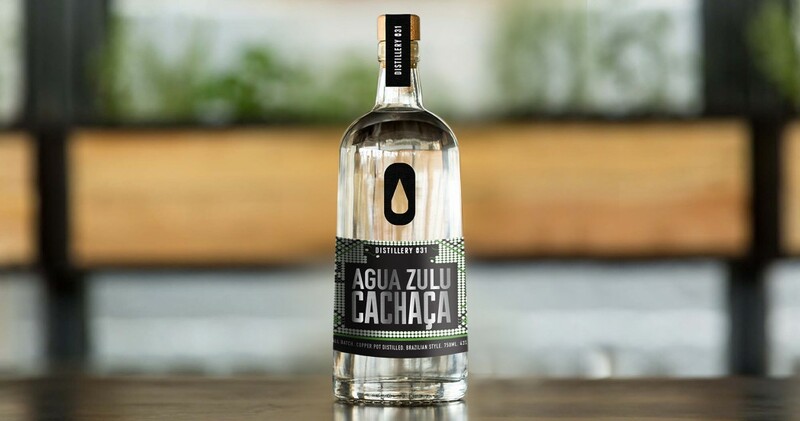 Água Zulu Cachaça (43% ABV) is crafted in small batches in our copper pot, using high quality KwaZulu-Natal sugar cane for a uniquely Durban flavour. The sugar cane juice used for Água Zulu Cachaça is pressed and fermented within 24 hours of harvesting to ensure that it retains the freshness of the sugar cane from which it is crafted. Água Zulu Cachaça is delicious sipped neat and works beautifully in traditional Brazilian Caipirinha and other cocktails. One of the secrets behind a great spirit is where the distiller makes his/her cuts. When creating Água Zulu Cachaça, we chose to keep only the smoothest hearts of our spirit run. In doing so the natural flavour of the sugar cane juice is retained without any of the volatile compounds which are often associated with cheaper cachaças. Água Zulu Cachaça has an inviting nose which alludes to the verdant sugar cane fields from which it is born. On the pallet fresh, grassy flavours open, followed by citrus and earthy notes. The finish is extremely smooth with warm butterscotch and vanilla flavours. For more than four centuries, cachaça has accumulated synonyms and creative nicknames coined by the Brazilian people. Some of these words were created for the purpose of deceiving the supervision of the metropolis in the days when cachaça was banned in Brazil; the beverage was competing with the European distillate grappa. There are more than two thousand words to refer to the Cachaça. Some of these nicknames are: abre-coração (heart-opener), água-benta (holy water), bafo-de-tigre (tiger breath), and limpa-olho (eye-wash). The name Agua Zulu comes from the Portuguese word “Água” which means water and Zulu referring to the Zululand region where the sugar cane is grown that Distillery 031 uses in its Cachaça. Cachaça is a distilled spirit made from sugar cane, first invented by Portuguese settlers in Brazil. The major difference between cachaça and rum is that rum is usually made from molasses, a by-product from sugar refineries, while cachaça is made from fresh sugarcane juice that is fermented and distilled. Today it’s the most popular distilled alcohol in Brazil, but its history goes back to 400 years ago when plantation owners began serving the liquid to their slaves after noticing that the drink lifted spirits and increased vigor. Thankfully slavery is a long distant memory and Cachaça had become a symbol of freedom and Brazilian identity, produced and consumed throughout the nation by diverse ethic and social groups.